By the end of July 1945, the defeat of Japan in the Second World War was imminent. On August 6 and August 9, the United States dropped atomic bombs on the cities of Hiroshima and Nagasaki, accordingly. On the day of the Nagasaki bombing, the Soviet Union declared war on Japan, violating the neutrality pact. On August 10, Japan agreed to accept the Potsdam Declaration and surrender. After several days of behind-the-scenes negotiation, Emperor Hirohito announced the surrender of Japan to the Allies. The announcement took place on August 15 in Japan, but in the USA and some other countries it was still August 14. 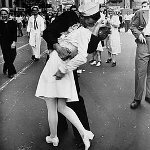 August 14/15 is celebrated as V-J Day in a number of Allied nations. In both Koreas, it is a public holiday known as Liberation Day. In Japan, August 15 is a solemn remembrance day marked by the National Memorial Service for War Dead. Some countries celebrate Victory over Japan Day on September 2, because on that day in 1945 the Japanese Instrument of Surrender was signed on board USS Missouri in Tokyo Bay. They include the United States and Russia.